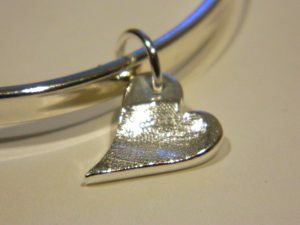 Thinking about having Jewellery made? Investing in personalised, bespoke jewellery is exciting. Capturing your impressive memories in a piece of jewellery is even better if you understand a little bit about what you are creating. Getting the results you dream of, and a beautiful, hand made and precious piece of jewellery. ARE THERE ANY AGE RESTRICTIONS FOR FINGERPRINTS? 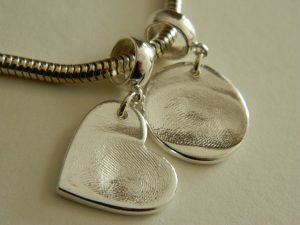 Fingerprints develop at different ages for everyone. 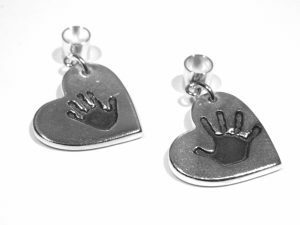 Most babies under 12 months old won’t yet have defined fingerprints, you will capture their little finger imprint but it’s unlikely to have ‘traditional’ swirls. An alternative is to take a print of a finger nail. There is no upper age limit either…older children, adults, grandparents – we all have our very own unique fingerprint. CAN MY NEWBORN MAKE ME IMPRESSIVE JEWELLERY? Oooohh Yes!!!!! 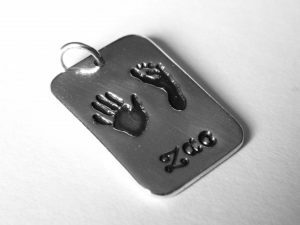 As soon your little bundle is in the world we can capture hand and foot prints. I need a print of the hands & feet and for this I use a very safe, gentle process to capture the tiniest of details, no messy ink. (These prints are beautiful to add to your baby memory books too). Any age can make mini prints. 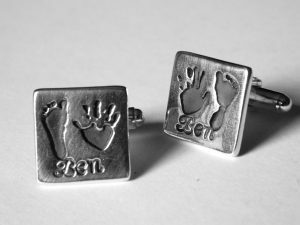 DO I HAVE TO VISIT YOU IN PERSON TO HAVE JEWELLERY MADE? You are very welcome to make a booking with me to take the prints for you, but…all jewellery can be ordered via my online shop. A kit will be posted to you to take the prints I need and you can do it all from home, your prepaid envelope will be in your kit to return the prints to me, and once your piece is ready I will post it back to you via Royal Mail Special Delivery. I HAVE PRINTS ALREADY, CAN THESE BE USED? Yes. These can be scanned and emailed to me no problem at all, or bring them to me and I will scan them for you. Yes. Every part of your jewellery is made by hand, by me. Each piece can be made exactly how you want it. 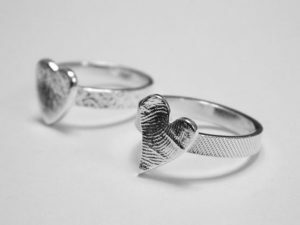 IS THERE ANYTHING I SHOULD CONSIDER IN CHOOSING A COMPANY TO MAKE MY JEWELLERY? 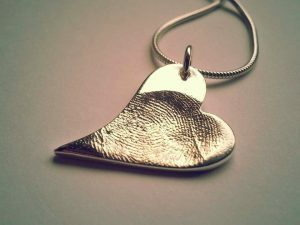 There are lots of ways to make fingerprint & mini print jewellery. The methods used will determine the strength and longevity of your investment. My work is all kiln fired, tumble polished and all joints are soldered. Each of these processes gives your piece added strength and security (soldering is a process in which two or more items (usually metal) are joined together by melting and putting a filler metal into the joint). HOW LONG DOES IT TAKE TO MAKE MY CHARM? Once I have your prints I need approx 10-14 days to make your items. At busy times of the year I will need longer. If you are in a hurry I offer an express service which guarantees your order will be ready in 7 days. I HAD JEWELLERY MADE BY YOU ALREADY, DO YOU KEEP MY PRINTS? I keep your prints on file with your order for 12 months. After this time they may no longer be available, please contact me to find out. All jewellery comes packaged in a gift box and a gift bag. If you book an appointment with me you are welcome to pay by cash, bank transfer, Paypal or credit card. If you buy through my website it uses Paypal. Still got Questions? Just ask…contact me HERE. 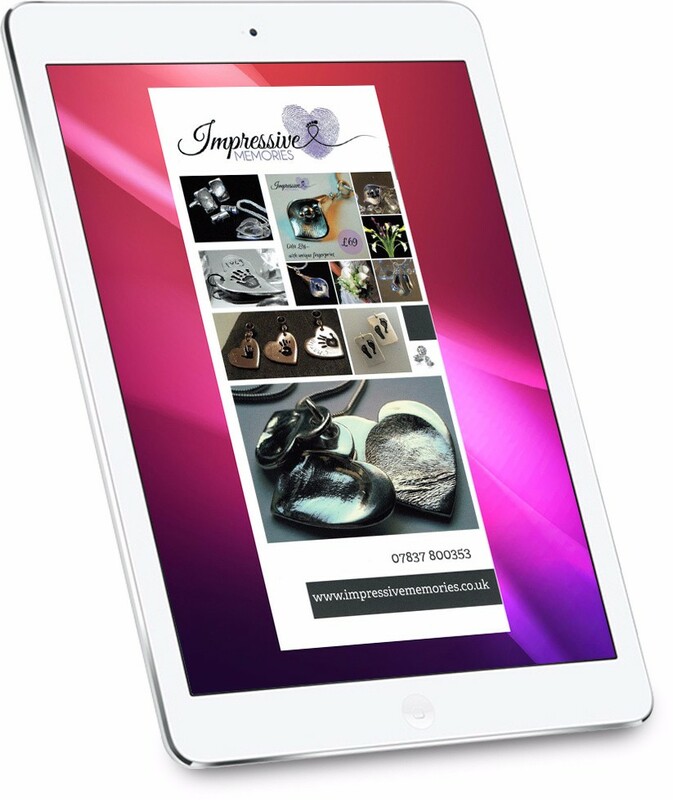 Would you like to download a copy of my jewellery Price List?